Listen to "A Far Cry from Kensington" on your iOS and Android device. Set on the crazier fringes of 1950s literary London, A Far Cry from Kensington is a delight, hilariously portraying love, fraud, death, evil, and transformation. 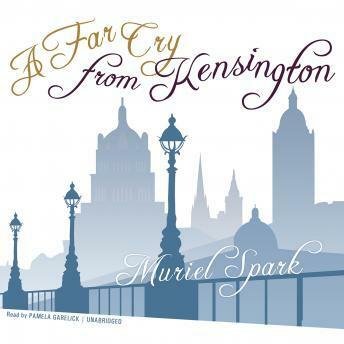 Mrs. Hawkins, the majestic narrator of A Far Cry from Kensington, takes us well in hand and leads us back to her threadbare years in postwar London. There, as a fat and much admired young war widow, she spent her days working for a mad, near-bankrupt publisher (&apos;of very good books&apos;) and her nights dispensing advice at her small South Kensington rooming house. At work and at home Mrs. Hawkins soon uncovered evil: shady literary doings and a deadly enemy; anonymous letters, blackmail, and suicide. With aplomb, however, Mrs. Hawkins confidently set about putting things to order, little imagining the mayhem that would ensue. A Far Cry from Kensington has been hailed as &apos;outstanding&apos; (Observer), &apos;wickedly and adroitly executed&apos; (New York Times), and &apos;a comedy that holds a tragedy as an eggcup holds an egg&apos; (Philadelphia Inquirer).